Product prices and availability are accurate as of 2019-04-14 03:25:18 UTC and are subject to change. Any price and availability information displayed on http://www.amazon.com/ at the time of purchase will apply to the purchase of this product. Get ready to ZOOM with Zoom Tubes. 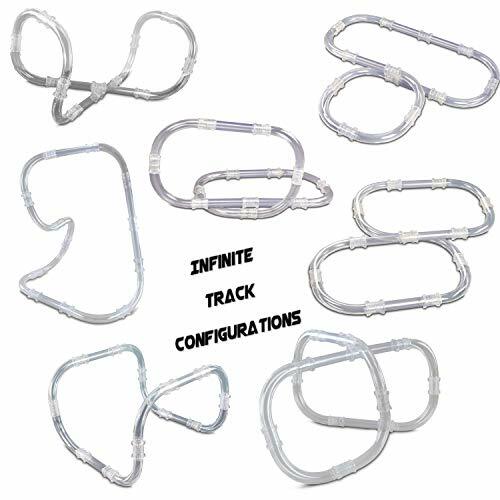 Easy to build and connect, simply snap together and lock in place and you're ready to race. Customizable tubular configurations, fast and straight, vertical or winding loops for non-stop racing fun. There are infinite track configurations to loop it up or twist it low let your imagination take control. The secret is the tubular technology that gives the Zoom Racer 360 degrees of light up gription velocity. Zoom Tubes is a nonstop racing light show. Great combination of DIY assembled tracks and RC racing to encourage hand-eye coordination, fine motor skills, problem-solving skills, and spatial awareness. 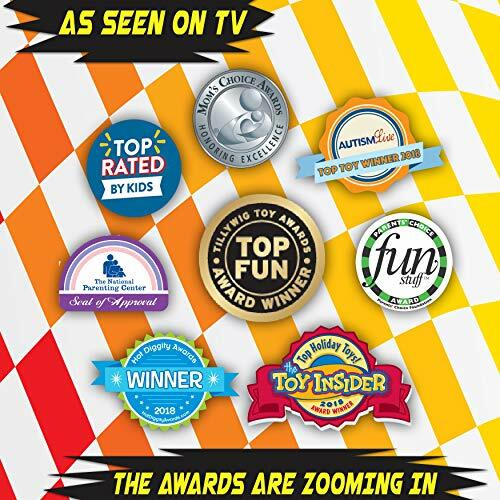 Get ready to Zoom Zoom Zoom with Zoom Tubes! 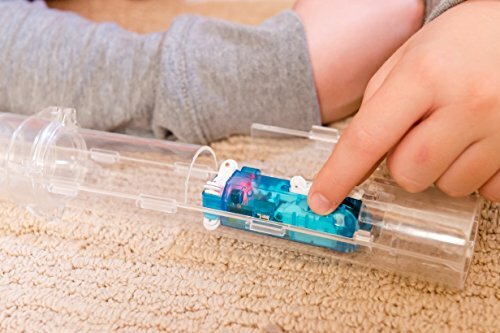 Just connect the tubular track and use the wireless remote control to launch your racer up, around, over and back! 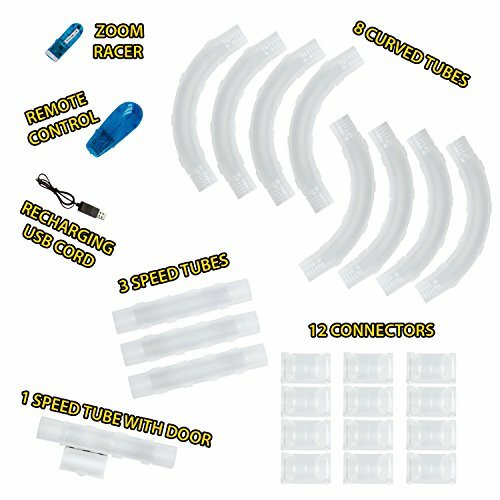 25 Piece Set includes: 12 Connectors, 8 Curved Tubes, 3 Speed Tubes, 1 Speed Tube with Door, USB Cord, and Zoom Racer with Remote Control. 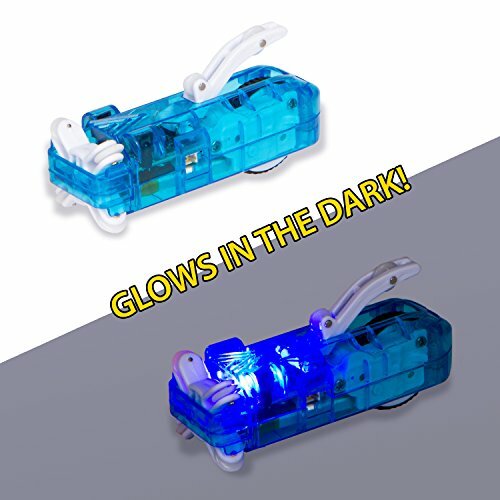 Requires 2 AA batteries (not included) TUBULAR TRACTION TECHNOLOGY: Gives your racer 360 degree light up gription velocity, creating a non-stop racing light show! 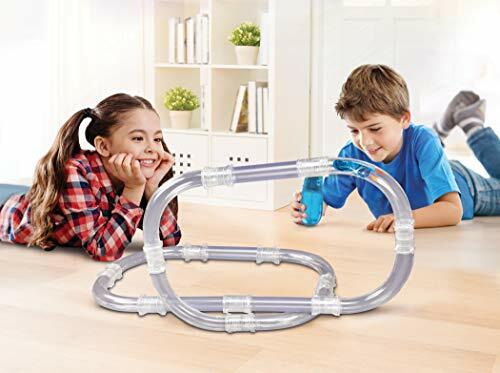 CUSTOMIZABLE TUBULAR FUN: Race around anything and anyone, the possibilities are endless! LET YOUR IMAGINATION RACE: Have fun while promoting creativity, focus and experimentation!